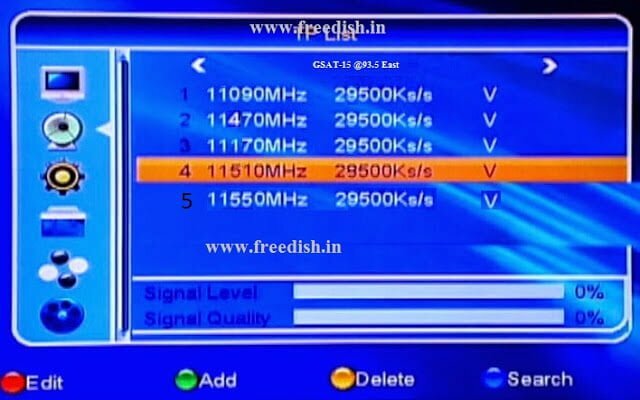 DD free dish the only free DTH service with no monthly charge will soon be migrating its services from existing Insat-4B to newly launched Gsat-15 satellite. As most of you know Gsat 15 was launched slightly before Christmas last year and was aimed at replacing Isat-4B and Insat-3A at 93° East. The satellite which has 24 Ku band transponders of 36 Mhz each will help DD increase its free channel offering especially on MPEG-4 platform which it has plans of encrypting but maintaining the free to air model. We request all DD Free Dish viewers to follow the below given steps to rescan or retune your set-top Box after 1st February 2016 to continue enjoying the service. sir mere DTH me bahut hi km channel aa rhe hai.. bs 16 kaise improve kre ise kuhch smjh nhi arhaa,google ke madhyam se bahut kosis kiyaa kucch smjh nhi aaya,pura btaaye ! !